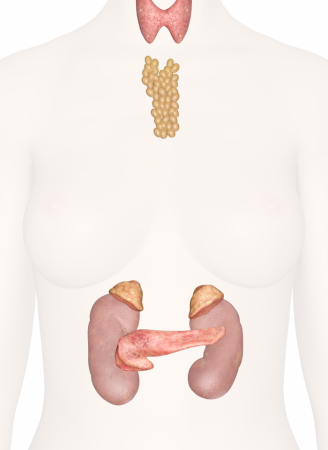 The endocrine system of the thorax contains only one gland, the thymus, but several other hormones are produced in this region by tissues containing endocrine cells. These hormones work to control aspects of the body’s immune, cardiovascular, and digestive systems. The thymus gland is a small, triangular gland located deep to the sternum and superior to the heart. It forms a key component of the immune system that trains and develops T lymphocytes (T cells) to fight off infections. A class of hormones known collectively as thymosins are produced by the thymus and used to stimulate the production and development of T cells during childhood and puberty. Although it is not an endocrine gland, the heart also produces two endocrine hormones: atrial natriuretic peptide (ANP) and brain natriuretic peptide (BNP). These two hormones are produced by cardiac muscle cells in the atria of the heart in response to increased blood volume or stretching of the heart in response to stress or exercise. In response to these factors, ANP and BNP reduce blood pressure by relaxing smooth muscle in blood vessels and triggering the kidneys to remove sodium and water from the body. Adipose tissue present throughout the body, including in the upper torso, produces a hormone called leptin. Leptin plays an important role in determining the body’s energy needs and helps to make the body feel satiated (satisfied) by reducing the sensation of hunger. As adipose reserves are depleted through decreased caloric intake or increased energy use, the feeling of satiation decreases and the body’s feeling of hunger increases. The body’s basal metabolic rate also falls in response to decreased leptin levels, reducing the number of calories burned at rest. Leptin thus triggers the body to take in more calories and burn fewer calories in order to replace lost adipose tissue and prevent starvation. Conversely, leptin also helps to prevent the body from consuming too many calories by decreasing hunger after a healthy level of adipose is reached.